But for seniors, meals can become constant reminders of diminished abilities and restricted diet plans. Mealtime can become uncomfortable, or even embarrassing, for those who struggle to use utensils or need help eating. The end result can be social withdrawal and poor nutrition. The Arbor Company created the Dining with Dignity® program to address those challenges. The program aims to use mealtime to promote independence, socialization and nutritional health for all residents. What Is Dining with Dignity® ? 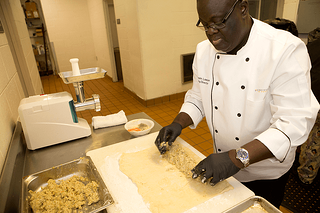 In Dining with Dignity®, specific food preparation techniques are used so residents with varying abilities can eat independently. Menus feature familiar dishes, but they’re prepared so that residents don’t need utensils to eat them. 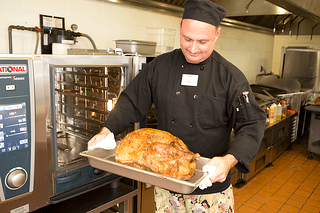 Arbor Company chefs use fresh ingredients to recreate popular recipes in bite-sized portions using a variety of preparation techniques, from puff pastry to crepes. Meals have the same taste and texture, but they’re easier for residents to handle, chew, and swallow. And dipping sauces and garnishes add even more appeal. "The Dining with Dignity® program ensures that ALL residents can continue to enjoy beautifully prepared and flavorful meals even as their skills change,” Mary Campbell Jenkins, the executive vice president of The Arbor Company, says. “Eating should be a joyful experience regardless of age or ability. Dining with Dignity® helps us make it so. What Are the Benefits of Dining with Dignity® ? Proper nutrition contributes to heart health, brain health, bone strength, energy and weight control among seniors, and Dining with Dignity® is intended to help them get there. Malnourishment among seniors was declared a national health crisis in response to one in three seniors admitted to hospitals meeting the clinical definition of malnourishment in 2015. Taste disturbances and difficulty accessing or preparing food were among most common reasons for senior malnourishment, the Gerontological Society of America found. Unfortunately, malnourishment is even more common among those with Alzheimer’s and other forms of dementia. Alzheimer’s Society recently highlighted a report that found as many as 45 percent of people living with dementia are malnourished. By making nutritious meals easier to eat without sacrificing taste or texture, Dining with Dignity® can help address the challenge of malnourishment among seniors while promoting socialization and engagement. 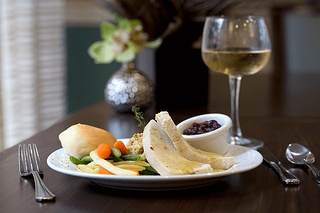 One of the first things you’ll probably notice about Dining with Dignity® is the elegant presentation of meals. That celebrates the dignity of residents, and it offers secondary benefits for residents with dementia. As memory problems become more pronounced, it’s not uncommon for our loved ones to become distracted by utensils and other items at the dinner table. Elegant meal presentation with colorful dipping sauces and garnishes have proven effective in preventing people with dementia from becoming distracted during meals. Additionally, because bite-sized portions don’t require silverware and are easier to chew and swallow, Dining with Dignity® makes mealtime safer and more convenient for residents with dementia. 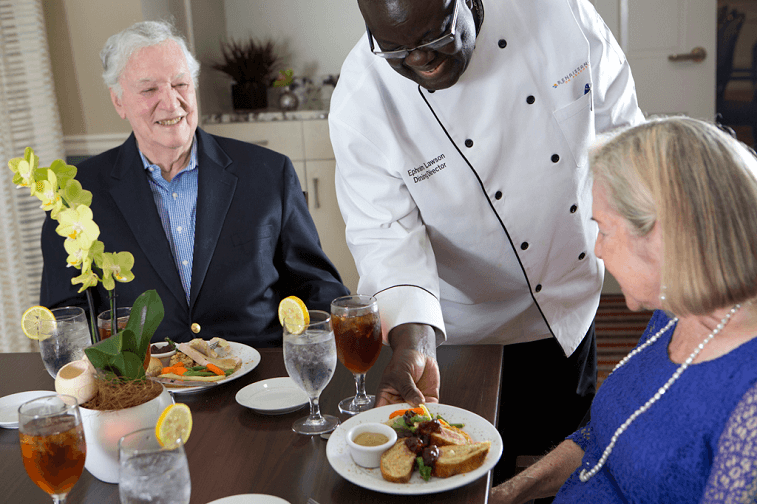 The Arbor Company’s Dining with Dignity® program aims to make mealtime an enjoyable, social experience for all residents. Popular dishes served in bite-sized portions using puff pastry and dipping sauces to make meals easier for residents to handle, chew, and swallow. The end result is a tasty meal that promotes independence, engagement and dignity for all residents.